The Continental will be made in Flat Rock, Mich.
DETROIT -- Ford Motor Co. has given the UAW some good news and some bad news this month as it prepares for a contentious round of contract talks. Ford, which will hold its traditional handshake ceremony with the union on Thursday, July 23, last week confirmed plans to build the 2017 Lincoln Continental in Flat Rock, Mich., alongside Mustangs and Fusions. That announcement helped temper anger among union members after Ford revealed plans to move production of the Focus and C-Max out of a nearby plant, likely to Mexico or another lower-cost location, in 2018. In addition to selling the Michigan-made Continentals in North America, Ford said it will export them to China. UAW officials celebrated that news even as they grappled with the sudden uncertainty surrounding the future of the Focus plant, known as Michigan Assembly. "It goes without saying that anytime Ford, or any domestic automaker, commits to American manufacturing, it provides a win for our members, the American middle class, and communities all across this country," UAW Vice President Jimmy Settles, who will shake hands with Ford executives on Thursday to formally start negotiations, said in a letter to members. 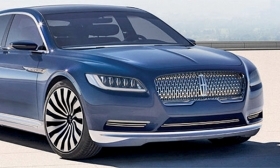 The Continental, which was unveiled as a concept version in April and goes on sale next year, will replace the Lincoln MKS, which is made in Chicago on the same assembly line as the Explorer. Moving Lincoln production out of Chicago will free up some capacity to build more Explorers, so no jobs will be lost at that plant. "With many products shifting production outside the United States, it's good to see Ford committed to keeping its flagship vehicle stateside," Kelley Blue Book analyst Akshay Anand said in a statement. "If the production version of the Continental has many of the features we saw in the concept, consumers will definitely take notice, both in the United States and areas such as China." UAW leaders said they are confident Ford will assign new nameplates to replace the Focus and C-Max and maintain a full production schedule at Michigan Assembly. The plant's future, which appeared as solid as any Ford plant before gasoline prices began dropping last year, is sure to be an important discussion topic during bargaining sessions.